Well, we are halfway into our first week back at work, and are getting back into our normal routine. I can’t say it seems completely normal, seeing that we have an unusual sight out our front window these days. I believe we are mostly unpacked. For the first three days after we got back, we ran outside every time we needed something that we had brought with us on our trip. We have a lot going on around here in the next month. In about three and a half weeks, the movers will be coming to take a bunch of our furniture to Harry’s son Andrew. He will be taking the dressers out of our bedroom set, the huge tv out of our bedroom, the desk and credenza out of the office and the queen size bed that was in our downstairs guest room. Then next month we take a few more pieces to Harry’s daughter. Our house is going to seem so much larger after all those huge pieces are out of here. We also have made an appointment with a realtor, who will be coming by next week to look over the house and work up a market analysis for us. All of our planning up to this point has been based on guesswork, and what we think and/or hope our house would be worth. So we have decided that it is time to find out a more solid number. So we have some organizing and arranging to do before next Wednesday! When we are finished, I will give you a little tour of the house. While Harry and I had an absolutely wonderful week last week – it was NOT relaxing, and we both headed back for our first day back at work today – exhausted! But now Monday is over, and we are home relaxing, and hopefully we will get back into the swing of things tomorrow. It is quite the strange feeling having the landmark sitting out in the driveway. I so want to be back out there on the road heading for someplace new! Both Harry and I agree that neither of us were missing our house when we were living in the fiver. I was missing our cats – if they had been with us, it would have been completely perfect! I thought I would take a couple minutes tonight to answer questions that have come up in the comments. Have we considered an RV parking pad in our driveway? No, not really. RVs are not anywhere near as common up here as we have found them in the more southern regions. We were so surprised to find an RV section at the Walmart we went to in Tennessee last week. I had never seen a section dedicated just to RV living before. Whatever we have up here would be found in the Sports section with the camping stuff. If we weren’t going to sell our house in the next year, we might consider it. But the likelihood that the people buying our house would appreciate another parking pad next to the driveway is not high. So we are going to work around the fiver in our driveway. Are we able to leave the RV in our driveway? As far as we know, they are not prohibited. Probably again due to what I said above – the issue just doesn’t come up very often around here. Have I driven the truck while we were towing? Nope. Haven’t actually driven the truck at all yet. I plan to, but I probably won’t until we take the RV driving school, which we plan to do as soon as possible. Next year, if we can, but definitely when we hit the road. This wasn’t a question, but a few people have mentioned walkie-talkies for communicating while we were maneuvering into a spot. What we did, and it worked GREAT, was use our phones. The truck has a bluetooth system that works through the radio. So I just called Harry and then we could talk about it as we were getting into or out of places. We had thought of it before we went to TN, and it really worked so well. So that’s all I can think of to write about tonight in my newly back to work state of mind! Have a great evening everyone!! Well, it “warn’t” pretty, but we are parked in the driveway. And we only tied someone up on the road once for a few minutes! I never realized what an incline we had in our driveway. I saw it yesterday when “Max” was working to move the fiver back toward the house. My car is parked under the front of the fiver, which is a weird feeling! Other than getting her into the driveway and setting up, it was an mostly uneventful day. Harry had to run to the hardware store to get more cement blocks because we didn’t have enough, and we temporarily lost the keys to the fiver. Oh, and we took the cats out for a little while to start letting them get used to their future home, and my little Ariel managed to find her way under the bed to hide and we had to force her out with a few sprays of water from a spray bottle. Ok, maybe it wasn’t too uneventful. But right now, I am in the “all’s well that ends well” frame of mind. We are already planning our next trip, which unfortunately will probably be our only other trip this year. We are going to go to Lake George for a few days in September, and I am already looking forward to it. Between now and then, we have a lot planned for the summer. Next on our agenda is cleaning out our office. Four weeks from today, the movers will be coming to take the furniture to Andrew. So we have some work to do before that weekend. But now I can always steal a few moments for dreaming….the dream is sitting in our driveway…. We started out this morning with our departure from the campground in Virginia.Packing up and hitching went very smoothly, and although it was a tight fit, we made it out of the campground without any mishaps. And then we were on the road. Today was a three state day, although we only traveled about 215 miles. There were dark skies all around us for parts of our trip, but we didn’t actually see too much rain – for a change!! We got off at the exit for the campground, with fingers crossed that this would be an easier landing. And the campground itself was so open – no concrete pads to negotiate around! And we have a nice large open pull through site. Only one little misstep for us – we forgot to make sure that our sewer connection was close enough to the campground sewer – and we had already unhitched! So we had to hitch back up to move the fiver a few feet. I don’t think our next door neighbor is going anywhere anytime soon. take out pizza delivered to our door. I could have entitled this post “what a day” AGAIN, but I guess I’ve used that one enough in recent weeks. We were heading out this morning for our next stop, Shenandoah Valley KOA in Virginia. We were both nervous about our first solo experience hitching up. But that turned out to be the easiest part of the whole day. The weather forecast for today was a 30% chance of showers. Well, we woke up to downpours! This would have been a day when, if we had a choice about the matter, we would have definitely stayed put and waited for a nicer day. But unfortunately, we are on a deadline, since we have to get home this weekend. So I took care of the inside stuff, packing up and securing everything, while Harry unhooked all the outside stuff. He was soaking wet by the time he was finished, and then came in and changed his clothes before we hooked up the truck. By this time the rain had stopped for the moment and it looked like we might be able to get going without being rained on. Nope, no such luck. The good news is that Harry did an awesome job hitching up. And we LOVE the auto leveling system. We just push one button and it retracts back to the height we were in when we unhitched. So easy. So as I said, hitching up was the easy part. I don’t know if you can tell in this picture, but we are really close to that cement pad. It wasn’t by design, that’s just where we ended up. And because of our angle in the site, we had to go left, and also miss the trees at the beginning of our site. It might not be as difficult as we found it, but for us newbies, it was a huge challenge!! As Harry came forward with the truck, the tires on the rv got way too close to the concrete pad. If it was an inch or two, that was it. So Harry did the back and forth maneuver a few times and finally got the fiver maybe three or four inches from the pad, and to the point where we could take the left. I was the lookout, and oh, did I mention that while we were doing all this, it was POURING. What a morning. We finally managed to get the fiver out of our site, and headed out towards Virginia. It was a gloomy morning, and we were just glad to be on the road. Also Harry had discovered that the fiver’s tires weren’t quite at the air pressure he would have preferred, so during the course of our trip, I believe we stopped at a minimum of 7 truck plazas trying to find a working air station. With no success, I might add. Harry has a small compressor with us, which he has used tonight, and a larger one at home. I’m quite sure we won’t be hitting the road without that compressor again after the day we had today. Then we finally had the KOA campground in our sights – only 3 short miles away. Let me rephrase that – 3 long, winding, curvy, narrow miles away. It’s a beautiful area, and our site is very nice, but I can say with quite a bit of certainty that we will not be coming back to this park. Let me show you around some of the natural features here. This is the left we had to make as we were traveling to our site. And from this corner, you can see the right turn we had to make immediately after the first left. And then finally one more left to get into our site. Whew!! And finally, here we are – all settled and comfy for the night. We even have our satellite tv! Yay!! Tomorrow we head for PA, and another pull through site, but I hope the roads to that one are a little wider and straighter! Survived Day One, that is! It was quite the day. This is a long blog entry – so be prepared! We started out with an early rising, because our slide awnings were coming in, and the guys were going to get started on them right away. We had to be away from the camper while they were working, so we had planned to go out for breakfast and then make a couple stops at a store. It didn’t quite end up working like that! Here’s the “short” version (which like I said, is not very short)…nothing really happened all morning because we were waiting for stuff to happen. We didn’t end up having breakfast out, or breakfast at all, for that matter! Our awnings were delivered around 12:30 pm. I think it was around 1 o’clock when they started working on the installation. Around 1:30 or 2, Butch came over to go over all the systems with us. Thanks to everyone who mentioned videoing them, because I did and it is great to know we have all that info on video. It is way too much to take in all at once. We did as much of the walk through as we could – all of the inside, and about half of the outside. Then we got to a point where we couldn’t do anymore, because the guys were installing the slide awnings in the area we were heading for. So at that point, it was decided that we would run the couple errands that we had planned on for the morning, as well as get a bite to eat! At this point, it was almost 3 o’clock. We went to Texas Roadhouse, then made a couple stops at Walmart and Harbor Freight. We then headed back to the dealership, where we found the guys just getting ready to start work on the last slide awning. It was almost 5 o’clock at this point. We watched them work for awhile, and then Butch came over to finish our walk through. And then it was time for the first hitching. It actually went really smoothly. Harry said that the window in the truck is low enough that he can actually see the hitch and where it connects to the trailer, so that made getting the truck in position much easier. And then it was time for the first drive! Butch drove at first, showing Harry how it moved, giving him some pointers, and demonstrating a few turns. After maybe 15 minutes, he pulled over and it was Harry’s moment to get behind that wheel! He did great. He took everyone’s advice and took it slow and easy. After driving back to the dealership, Butch had him drive into the truck lot next to the dealership and had him make a few turns. He backed it up, and took it in a half circle. Then, we were on our own. After handshakes, and a couple more words of advice, we drove out of the dealership on our own with our new fiver. At this point it was about 10 after 7, and we had a 40 minute drive ahead of us to the campground. One thing I have neglected to mention is that there were dark clouds all around us from about 5:30 on. We could see the lightning off in the distance as we were riding along. So on top of just the normal getting set up stuff that we were thinking about, we also knew that it was just a matter of time before the storms came through. We actually hit a couple periods of hard rain as we were driving to the campground, but when we arrived here, it was only cloudy – no rain. At the campground is where we took our first wrong move – we went straight into the campground as we had been told, but we actually should have turned left. So we had to make a circle, and then Harry had his second experience with backing up, so that we could go in the opposite direction. But thankfully, the area was large and straight and he backed up with no problem at all. So we went back in the correct direction this time and our site was the third site on the left. I don’t have a lot to compare it to, but it seems tight. There was not much wiggle room – basically one strip in which the fiver had to go. Hmmm, all I’m going to say here is that both of us have room for improvement. We are going to practice in a large lot when we get home, so that I can give better directions, and Harry will have a better idea of how the fiver moves when he makes certain turns of the wheel. And you know all those stories of “newbie” parkers drawing a crowd? Yup. It really happens. But the good thing is that a couple guys who were watching helped give Harry directions as he was backing in, and we made it in to our site! And I wish that was the end of the story – but it’s not. So we are getting ready to start hooking up. We get the truck unhitched, and Harry took his bin out of the basement. There were people in the pool across from us, and other people had a campfire going at their site. And all of a sudden, we hear thunder. And we turned around and looked over the treeline, and we could see really dark clouds and lightning heading our way, and fast! So we ran over and got the electric hooked up, and that was all we had time for. It was starting to rain, and it was obvious the storm was very close. Harry threw the bin back into the basement and I ran to the truck and grabbed our stuff and we ran into the fiver – just in time! It was raining – HARD! We then discovered that we really didn’t have electric, because in the rush to beat the storm, we hadn’t turned the breaker on. So we just sat there, in our warm, stuffy fiver, with a couple lights on, and waited for it to pass. It was maybe another 15, 20 minutes. I’m not sure because at that point we weren’t looking at the time. Afterwards we headed back outside – with a flashlight, because at this point, it was dark. We got the electric turned on, and hooked up the water. That was all we did last night. It was still raining, and the storms were still around – but they were far enough away that we were able to get outside to do those things. So that was our first day! This morning it was nice when we woke up, so we got our sewer hooked up, and our water filter out, and the satellite is locked on so we have tv. We are just enjoying the fact that we don’t have to move today! Even with all the difficulties and challenges of the first day, we LOVE it! 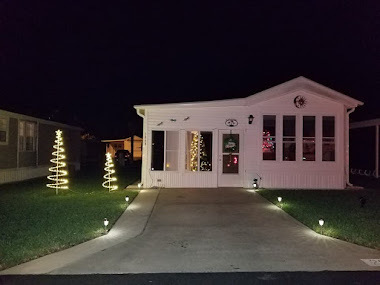 Tomorrow we head for a campground in VA – a KOA campground. And we have a pull through site! Woohoo!! It is 9:50 pm and we have just had a quick bite to eat after a VERY long day. Much to tell – but it will have to wait until tomorrow. So I guess it’s time for that tour of our new place after all. We were up bright and early this morning, after a very short night, and we didn’t even rest this afternoon! We had too much excitement going on around here. Here is our “interesting” view – out the back window and front window. A little after 8 am the guys came over and picked up our truck. Max is on his way! And a couple hours later, Max was back and outfitted with our new hitch. I unpacked the last of our supplies, while Harry figured out how to work everything, like our new fireplace. And our tv works too! We have both been enjoying ourselves today so much! I cooked our first meal, and found a place for everything. I think something that we are both finding strange is that we don’t feel like we’re on vacation. Being in our fiver just feels very normal and life seems natural. It is going to be so difficult to go back to “reality”. I took pictures of the whole place for a visual tour but I think I already have enough pictures in this post for one day. I will post them soon – as soon as I have a day without a lot of other stuff going on! It probably won’t be tomorrow – because tomorrow will be our first hitching and towing experience. I will have lots to share, I’m sure. Wish us luck!